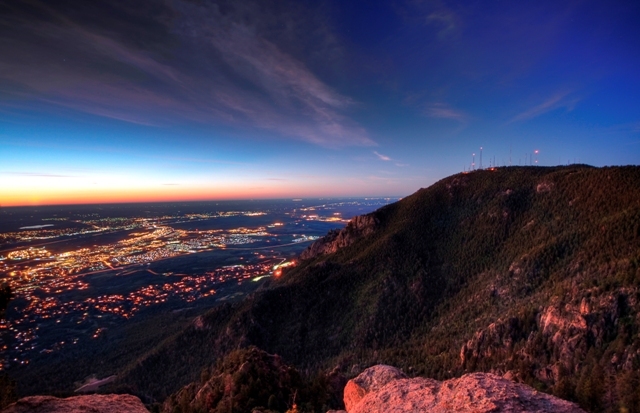 The night view of Colorado Springs’ is looking very impressive from 9,200 feet up Cheyenne Mountain. It’s made all the more impressive courtesy of the five course all inclusive dinner I’ve just completed in a camp 9,200 feet up Cheyenne Mountain. Not a camp under canvass you understand, but an entirely different kind of camp. 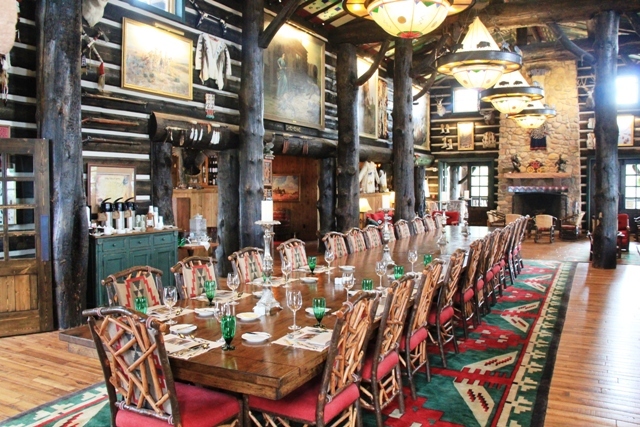 In the magnificent splendour of The Lodge, the rustic mansion that is the beating heart of Cloud Camp at The Broadmoor. This is unashamedly luxurious wilderness living; an opportunity to literally live the high life away from just about everything except Mother Nature and a few of your fellow guests. 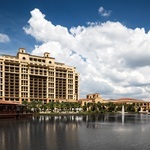 Cloud Camp at The Broadmoor is the latest option open for guests at one of America’s most luxurious and legendary resorts. Once the grandiose property of turn of the century mining millionaire Spence Penrose, The Broadmoor Resort has been stuff of legend ever since. And with good reason. There are over 750 rooms, 3 championship golf courses and 19 restaurants and cafes within the Broadmoor estate, and while it’s clear this is a very special place to stay, it is a resort. An impressively fine one of course, but still a resort. The genius of Cloud Camp at The Broadmoor is it offers something entirely unique in high end living. A private luxury retreat where you can simply enjoy a wilderness experience and be pampered at the same time. It takes nearly 45 minutes of hairpin turns to get to Cloud Camp at The Broadmoor, or so Larry my shuttle driver informs me. “And we get exclusive access to drive through Cheyenne Mountain zoo on our way up.” I could have opted to go up by mule for the full wilderness feeling, but somehow Larry persuades me his ride would be “just a little more comfortable”. Both the zoo and the mountain road were built by Penrose as was his original Cheyenne Lodge atop the mountain.. All part of his master plan to offer his guests the best of everything. 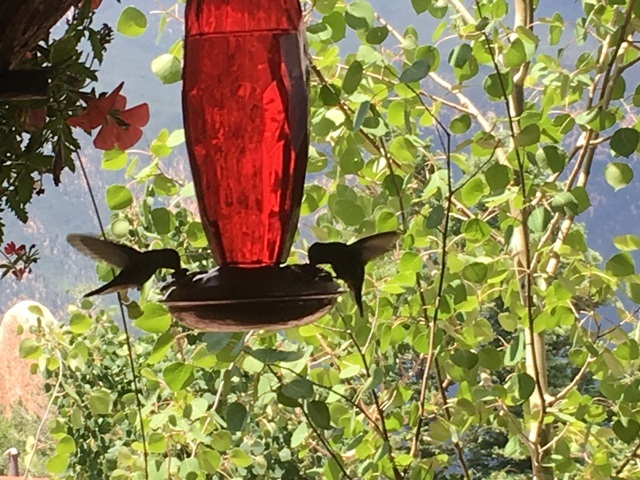 These days The Broadmoor, under the ownership of global entertainment mogul Philip Anschutz, has enjoyed the kind of investment and expansion Penrose could only dream about. And, as a nod to the former entrepreneur , the new Lodge is built on the very spot where Cheyenne Lodge once stood. Finally I reach Cloud Camp and fall willingly into its open arms. Manager Sasha walks me across to my two bedroom cabin just a few steps from the Main Lodge. I say cabin, but in all honesty this is a rustic palace. Adirondack style furnishings hold hands with Native American rugs and throws, while Indian art frames the walls. The bathroom is cosy, but with luxury fittings and filled with high end toiletries. I spot the coffee pod machine on a corner table and take a well earned break sitting on a rocker out on my porch sipping a brew. There is literally no sound save for birdsong and a distant coyote and I feel nothing but splendid isolation. Cloud Camp is all inclusive, that means my meals and all house wines and spirits are included. It also means there are activities for guests too, from cookery lessons with the chef, archery and morning yoga to craft and weaving sessions and guided hiking. 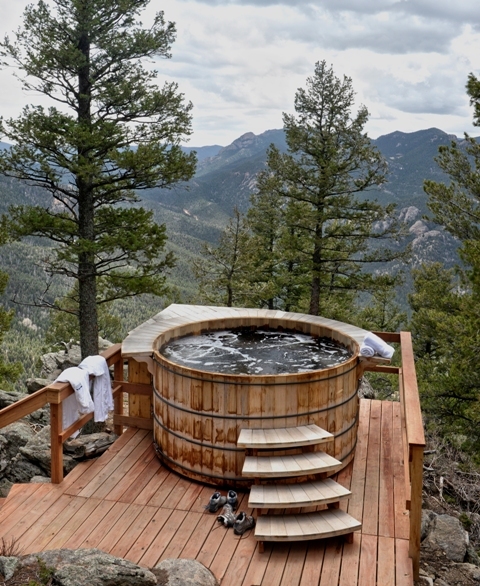 I make a mental note to go hiking tomorrow, but the draw of a hot tub in the wilderness is far too strong, so I don my fluffy luxury robe and walk down a rocky trail to find twin tubs waiting for me. Dinner is a 6.30pm communal affair around the immense dining table in the Great Room of the lodge, but before all that, cocktails and appetizers are served from 5.30. With the warm glow from my hot tub still on me, I sit out on the lodge wrap around terrace sipping a smooth Merlot while nibbling Serrano ham, mozzarella and basil covered crostini and gawping at the views. This is all very civilized yet quite surreal at the same time. The room is filling up with fellow guests now and word has gotten around there’s a Brit in the Camp. As we all sit for dinner around the huge table, I’m quizzed about the Brexit situation. “What is Broxat anyway.” Asks Cindy from LA, here with her husband. “It’s Brexit” answers Pete from Delaware, I silently thank him for saving me an awkward moment. I make an effort to explain the machinations of the European Union through a first course of Lobster bisque or warm asparagus veloute with tomato Provencal and tarragon. Cindy’s eyes glaze over. As we move onto the next course, the conversation has also thankfully moved on. The wine continues to flow, and so do the dishes; diver caught scallops, Rocky Mountain trout, or beef tenderloin is promptly followed by a choice of salads. I go for a Kentucky Limestone Bibb Lettuce with Roquefort cheese, cherry tomatoes, red onion and French dressing. It is customary for Cloud Camp guests to always enjoy a “Chef’s Surprise” and tonight we are presented with some southern chicken in honour of the place of birth of tonight’s chef. This is a banquet fit for a king, and I extend my gluttony to a Banana pudding dessert before falling into a rocking chair to watch the sunset over Colorado Springs far below. The air is cooler now, but still warm enough to sit out and chat. Cindy and her husband have drifted away perhaps frightful of any more Brexit conversation..
After a night of blissful unbroken sleep, the morning sun is already warm as I join in an hour’s yoga tuition before breakfast. There is something very spiritual about doing yoga up in the heavens. I spot Pete making straight for the Lodge, his buffet breakfast clearly more important than getting any spiritual enlightenment. I have to admit, I’m a little envious of him as I attempt another downward-facing dog. Thankfully, with my ying and yang now in perfect harmony, I’m free to follow Pete and enjoy the Cloud Camp breakfast buffet. I’m true to my word and take that promised hike. Sasha hands me a walkie talkie “just in case you need any help” and I give the Macneill trail a go solo. A six mile round trip with a 1,500 feet elevation change. There are many trails you can take up here, ranging from easy to difficult. But all of them offer spectacular views and the rock formations are quite extraordinary. 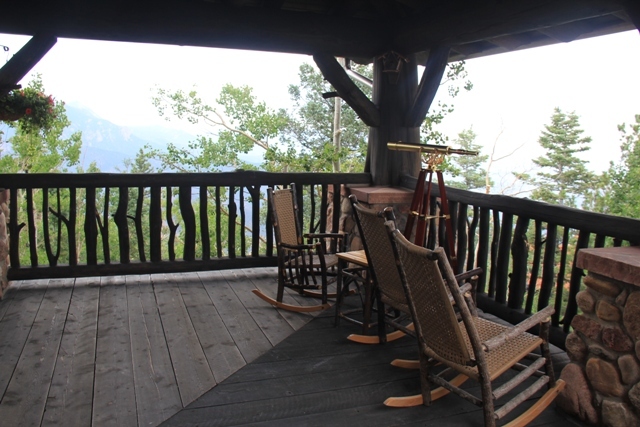 Again, there is something a little special in hiking a mountain which is just reserved for you. It is a privilege. 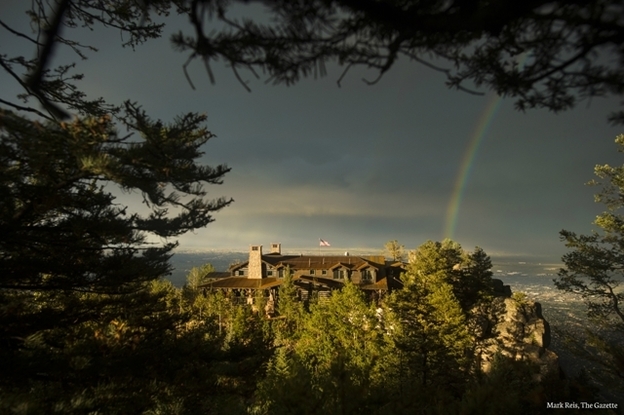 Cloud Camp at The Broadmoor is a perfect retreat in every sense of the word. 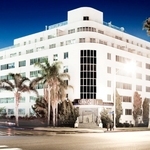 You can even mix it with a little bit of Resort time too and get the best of both worlds. For my return to the real world I glance at the mules, but look up to see Larry pointing to the inside of his Cadillac Escalade.. He’s right of course. Why take a mule when I can stretch out my taste of luxury for another 45 minutes. Tell me more about Cloud Camp at The Broadmoor. 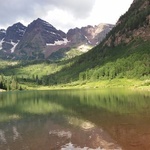 Cloud Camp at The Broadmoor is open from May to October. 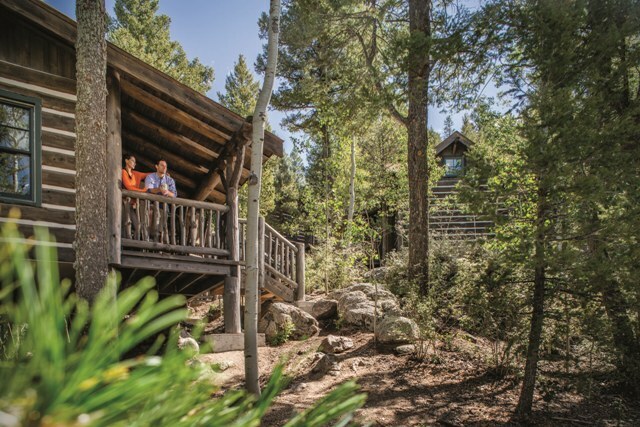 It has 15 one and two bed cabins (including the lofty Fire Tower Suite 145 steps higher than the rest of the Camp) and 6 rooms in the Lodge.